Mexican organizations have spent the past winter and spring building power in efforts to influence the impending U.S. immigration overhaul. For the past three weeks, a group of Mexicans has been traveling across the United States to raise awareness about the humanitarian crisis occurring along Central American migration routes. According to the caravan organizing alliance Acción Migrante, tens of thousands of Central American and Mexican migrants have been kidnapped or have disappeared over the last seven years while attempting to reach the U.S.-Mexico border, making these migration routes among the most dangerous in the world. On Thursday, family members of those who have disappeared will speak at Federal Hall in New York City about the crisis before the group returns to Mexico. But once they arrive, the work will only continue. Coalitions of Mexican organizations have spent the past winter and spring building power in efforts to influence the impending U.S. immigration overhaul from the other side of the border. One of the most recent actions occurred during the first week of May, when President Barack Obama visited Mexico. His objective: To meet with the man who occupies Mexico’s presidency, Enrique Peña Nieto, to discuss trade relations, national security and immigration policy. This trip was Obama’s fourth visit since he began his first term in January 2009, and it served as a striking indication of how Mexican public opinion had shifted its stance towards the Obama administration. During his first trip in April 2009, he was received in Mexico with joy and optimism by a society that had been given hope by his message of “Yes We Can.” Many saw his election in the United States as a positive sign of change for Mexicans living on both sides of the border. In contrast, this May, during Obama’s first official visit since being re-elected, his reception was one of indignation as Mexicans reacted to the degrading treatment they had been endured as a result of Washington’s immigration — and particularly, deportation — policies. 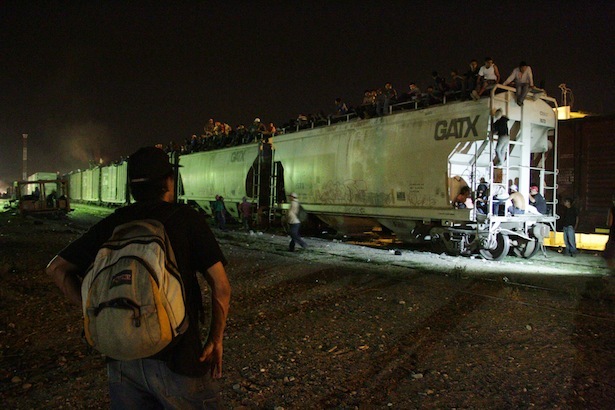 Obama arrived in a heavily armored Cadillac known as “The Beast.” But in Mexico, this title refers to a different, and far less secure, form of transport: the north-south traveling cargo trains onto which Mexican and Central American migrants scramble in pursuit of a better life in the north. 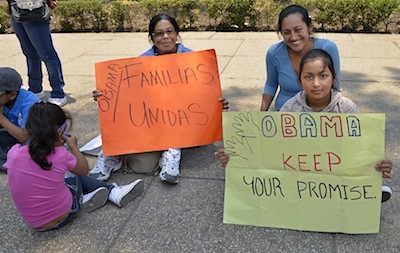 To express this disappointment and outrage, a coalition of organizations and collectives that work for migrant rights organized a “Day of Migrant Action” on May 3 to coincide with Obama’s visit. Deported migrants, migrants in transit, family members and organizations met in front of the U.S. Embassy in Mexico City dressed in orange shirts, with black lettering that read “for an inclusive and just immigration reform in the United States,” and “stop attacks on migrants and migrant rights’ defenders in Mexico.” Seventy-two of the protesters numbered themselves one to 72 and drew their silhouettes with chalk on the ground to remember the 72 migrants that were assassinated during August 2010 in San Fernando, Tamaulipas, a city only 85 miles away from the Mexican-American border. That attack was the first of a number of unsolved massacres that have been carried out against migrants in the region, including one in April 2011 where at least 193 people were murdered and later found in clandestine graves. The action was part of a larger campaign to give visibility and a human face to the “Declaration for Migrant Rights,” a document that enshrines human rights to migrants. More than 50 organizations signed the document on December 18, International Migrants Day, and began organizing a campaign to draw attention to these rights. Earlier that day, 10-year-old Angélica Torres wrote a letter President Barack Obama, which her mother, Margarita, read in front of the pillar. Torres has lived in Mexico with Margarita since her mother was deported from the United States. Margarita worked for two decades picking apples, cherries, grapes and asparagus in the fields in Washington state, but when Immigration and Customs Enforcement told her to leave voluntarily, she obeyed the orders and left the country with her daughter. Now, since Margarita has been unable to secure a travel visa, it has been two years and seven months since either has seen the other members of their family. Tens of thousands of families have been separated as a result of the United States’ immigration policies. To illuminate this reality, the organization Mesoamerican Migrants Movement organized a letter-writing action called “Don’t Deport my Mama” on May 2, recognized as International Children’s Day, in which children whose parents were deported wrote letters to the U.S. Embassy. Parents like Margarita often migrate north in search of employment and an escape from poverty — but with few rights for migrant workers, this labor rarely translates into liberties. Verónica Solís had worked in the United States without authorization for 10 years because, she said, of “the lack of opportunities that our Mexican government offers us, which forces us from our homeland.” She explained that during her decade in the United States she paid her taxes and contributed to her community, just like any other citizen. But assuming these responsibilities didn’t grant her any of the rights associated with citizenship. To her, Obama’s administration is characterized by its attempt to surpass the deportation records of its predecessors. According to Marco Castillo, an organizer for Acción Migrante, accounts like Solís’ and Torres’ are common. “Mexico and the United States become more like family every day, and less like neighboring countries,” he said. Many families that migrate begin new lives in the United States, often marrying and having children who become U.S. citizens. The problem, Castillo explains, is that these blood ties aren’t reflected in the domestic and international laws. Take the Torres family, for example: Some members have legal residency to be in the United States; some, like her mother, do not have legal U.S. residency status; and others, like Angélica, are American citizens. In a situation like this, the United States’ current deportation laws affect the whole family — especially the children. In her letter to Obama, Angélica symbolized this reality by drawing a U.S. flag and a Mexican flag separated by a wall. On one side was an image of herself with her mother; on the other side stood her father, her brothers and nephews. “Obama and Peña Nieto, rather than focus on human beings, they focus on so-called ‘national security’ — prioritizing their political interests, their power, over life itself,” Castillo said. Both politicians, he said, have refused to accept that mass human migration is a process that Mexico — and much of the rest of the world — is experiencing. As a result, he worries that Obama’s idea of immigration reform will look more like an international security accord. Acción Migrante is demanding an end to the humanitarian crisis that has put the lives of more than 30 million Mexicans on either side of the border at risk, as well as the more than 400,000 migrants who make the journey north across Mexico every year. Lets bring our troops home and secure our borders. I forgot Obama wants more people on the goverment teet.Socailism here we come.